We left you with a bit of a cliffhanger yesterday, as a former PocketFives no.1 player was heads-up for his second bracelet. The two players returned on Saturday to finish things off, and in just five hands Calvin ‘cal42688’ Anderson had secured the jewellery. Saturday was an action-packed day at the 2018 World Series of Poker, both in and outside of the Rio. Two online bracelet winners were crowned, as well as the champion of the Ladies Event. Here’s all the info from June 30. 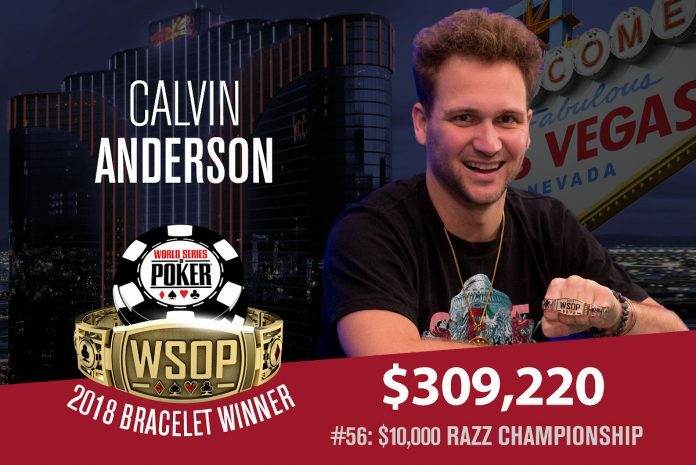 When we last spoke, we told you that Calvin ‘cal42688’ Anderson had a huge chip lead against three-time bracelet winner Frank Kassela in Event #56: $10,000 Razz Championship. The two had paused play at the end of Friday night, and when they resumed action on Saturday the whole thing was over in just five hands. In the last hand, Kassela had a ten-low draw while Anderson, who was already ahead in the hand, had a seven-low draw. He peeled over a five to complete a seven-five, and Kassela could only muck. Anderson reflected on his success in his winner’s interview, telling WSOP reporters: “I spend a lot of time studying the Law of Attraction and a lot of other universal and spiritual truths from various people, and basically, I think it’s important to keep a positive attitude because then you attract a lot of positive things in your life. One woman has outlasted 695 others to become a WSOP bracelet winner: Jessica Dawley. She’s banked $130,230 for her efforts over the past three days of play in Event #57: $1,000/$10,000 Ladies No-Limit Hold’em Championship. Jill Pike led the final table coming into play on Saturday, and she would ultimately meet Dawley heads-up. Pike had doubled up Dawley early on in the finale, and Dawley took those chips and used them to eliminate Tara Cain in sixth. Pike still held the chip lead though, but when things got three-handed Dawley went on a run that saw her collect 50% of the chips in play. Lisa Fong then crashed out in third, running her ace-six into Dawley’s pocket kings, before a short, four-hand heads-up battle ended when Pike shoved five big blinds with king-four and was called by eight-five suited. A five on the flop was all it took to end it. The first online bracelet event to end on Saturday actually began on Friday, continuing into the early hours of the morning. Event #61: $1,000 WSOP.com ONLINE No-Limit Hold’em Championship finally ended with Ryan ‘Toosick’ Tosoc holding all the virtual chips, winning $238,778 in the process. Tosoc outlasted 1,635 entries to win his first bracelet, defeating Anthony ‘Flawlessbink’ Maio heads-up. Later on Saturday, Event #63: $3,200 WSOP.com ONLINE No-Limit Hold’em High Roller kicked off, attracting 480 entries. When all was said and done, it was Chance ‘BingShui’ Kornuth who took it down for his second bracelet and $341,598. The entire tournament was wrapped up in just 12 hours, with ‘bewater’ finishing runner-up. They’re down to just nine in Event #6: $365 GIANT No-Limit Hold’em, as the massive 8,920 field has been whittled down over six days of play (five starting flights, and Saturday’s Day 2). Only 527 players returned today, with Alexander Lakhov holding the chip lead. He’d manage to ride that stack to the finale, coming in third in chips (38.3 million). However, it’s Renato Kaneoya (56.1 million) and Luis Vasquez (42.7 million) who top the counts. All nine are guaranteed $24,353 when play kicks off at 2pm Sunday, but there’s $250,000 up top, plus the bracelet and the glory. Could this be the one in which ‘JRB’ wins his first WSOP bracelet? Things are certainly set up perfectly for John-Robert Bellande, as he holds the lead in Event #58: $5,000 No-Limit Hold’em 6-Handed with a final table set. Bellande has almost double his closest competitor, with 5.05 million to Dean Lyall’s 2.7 million. JRB has never managed to secure a bracelet despite racking up $2.2 million in WSOP career cashes. Throughout the day we lost 21 players, including the likes of Greg Merson (19th – $21,018), Jimmy Guerrero (12th Place – $34,545), Dave Stefanski (11th Place – $34,545), Arsenii Karmatakii (10th Place – $45,764), Sergio Aido (9th Place – $45,764), James Mackey (8th Place – $61,931), and Arthur Morris (7th Place – $61,931). A sixth-place finish is worth $85,570, but there’s $616,302 up top when action resumes at 2pm Sunday. Michael McKenna has ended Day 2 of Event #60: $10,000 Pot-Limit Omaha Hi-Lo 8 or Better Championship as chip leader, with just 24 players remaining. McKenna, eyeing up his second final table of the summer, bagged up 1,048,000 and is the only player above a million. He’s followed by Ali Abduljabbar with 804,000, and Michael Abecassis with 699,000. There were plenty of casualties throughout the day, including Daniel Negreanu, Phil Hellmuth, Allen Kessler, Brian Rast, Ben Yu, Robert Mizrachi, Jesse Martin, Rep Porter, and defending champion Bryce Yockey. A few notables who went deep and cashed include Nick Schulman (35th for $15,000), Andrew Kelsall (34th for $15,000), Ryan Laplante (32nd for $16,494) and Ian O’Hara (29th for $16,494). There are still plenty of big names in the hand for this one, with Nathan Gamble (640,000), Jim Collopy (582,000), Cliff Josephy (480,000), Randy Ohel, (476,000), Brandon Shack-Harris (417,000), Chris Ferguson (344,000), David ‘ODB’ Baker (319,000), Phil Galfond (308,000) and Eli Elezra (146,000) all returning tomorrow. Play gets going again at 2pm, with $567,788 awaiting the winner. Event #62: $888 Crazy Eights No-Limit Hold’em Eight-Handed got a big turnout Saturday, with 1,908 players taking part over two starting flights, all hoping to win the guaranteed $888,888 first-place prize. After 24 levels of play, that field is down to just 90, and it’s Christian Liel who tops them all with 793,000. A few notables to advance include Nissar Quraishi (377,000), Jiri Horak (199,000), Mike Leah (155,000), Shai Zurr (87,000), and Galen Hall (64,000). It wasn’t such a good day for Barry Greenstein, Greg Raymer, Joseph Cheong, Shaun Deeb, Faraz Jaka, Alex Foxen, and DJ MacKinnon, as they all hit the rail. There will be two other starting flights tomorrow, starting at 10am and 5pm.